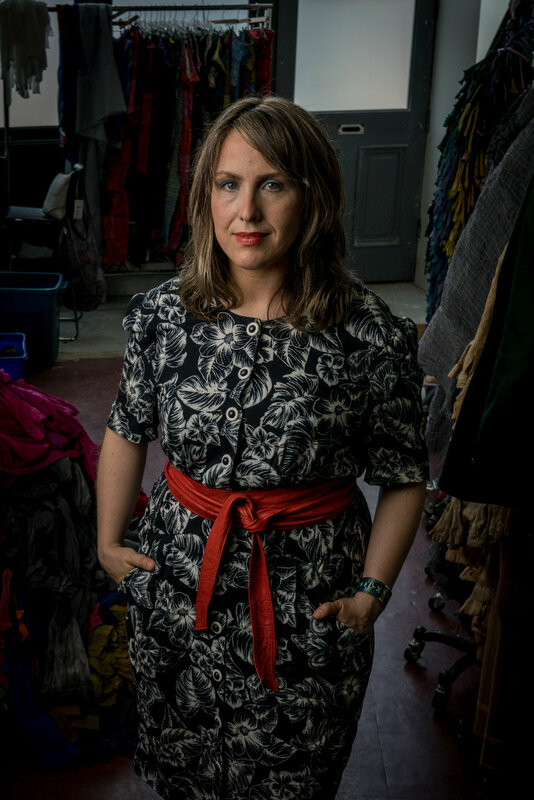 Katherine Soucie is an award winning Vancouver, Canada based artist + designer + entrepreneur + educator specializing in the transformation of textile industry waste. She studied Fashion Design in London and Toronto before furthering her studies in Textiles and Visual Art in Vancouver. In 2003, Soucie established a zero waste textile design company, Sans Soucie, which translates from French to “worry free” or “without a care”. This studio focuses on the development of a proprietary textile process she incubated while she was a student. Her process involves the recycling of pre-consumer hosiery mill waste (aka. pantyhose) using environmentally friendly artisanal processes. This waste is reconstructed into new cloth and made into clothing, accessories, home decor and 3D forms. This unique textile has only been made available for use under the house label and not produced anywhere else in the world. Her experimentation with textile industry waste has resulted in an extensive body of work driven by her desire to integrate hand -craft applications with industrial processes. Thus, creating meaningful textiles that encourage the act of use and reuse where materials are made with care in respect to our environment. Her textiles, garments, accessories and sculptures have been showcased throughout Canada, US, Japan, China and Australia. She is a recipient of the BC Creative Achievement Award, 2006 (Canada), shortlisted for the Niche Award 2007 (USA), recipient of the International Design Green Award for 2008 (USA) and shortlisted for the Sustainable Art and Design Competition 2014 (UK). Ms. Soucie is the Program Director for Fashion at LaSalle College Vancouver. She is the upcoming Artist in Residence with the City of Vancouver, Yaletown Roundhouse, 2019.